In 1989, my mother offered to buy me a sewing machine, as she had done for my older sisters. 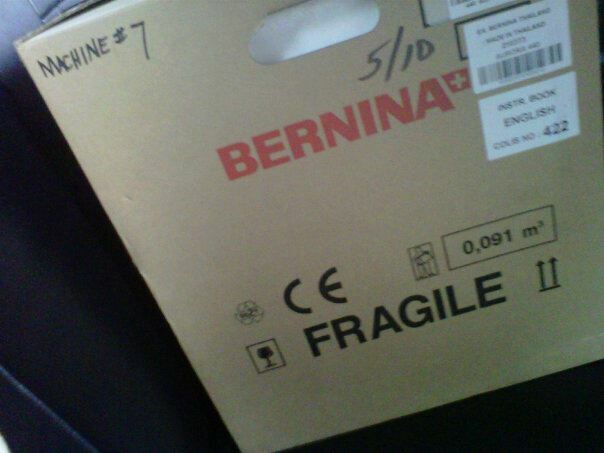 We went to the sewing machine dealer and she gave me two options: 1) I could have a new Brand X machine (I honestly don't remember the brand) or 2) I could have a 1969 Bernina model 731. 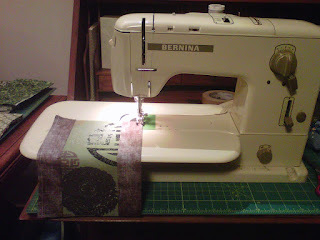 The 731 was very similar to the model 530 my mom has had since she got married; the machine on which she taught me to sew. I don't remember pausing at all before telling her I wanted the Bernina. She paid $275 for it, which was a hefty sum for her back then, but it seems like a bargain to me now. I've sewed on that machine ever since. I've used it to make skirts and dresses, curtains and pillows, quilts and quilt tops, and even a few improvised chair covers. It's a great machine, built like a tank and still going strong. But, it doesn't do many stitches and I'd starting getting a little envious of my friends' newer and more amply equipped machines. The question was, would I buy a different brand that might get me more features for less money, or would I spring for a newer Bernina that would probably cost more, but would likely last forever, just like my old machine? A dilemma. So, when I heard that The City Quilter was upgrading its classroom machines to new 550QE models, and they'd be selling the old 440QEs, it got me thinking. They were having the machines completely refurbished and they would come with a new-machine warranty. 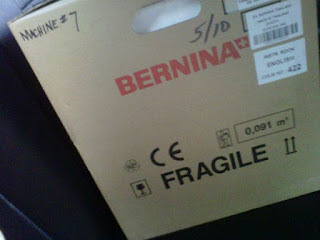 Still, a Bernina is rarely cheap, and I while I considered the price fair, it was still a hefty sum. After discussions with my husband (who is surprisingly supportive of my quilting habit) and my sister (who is always surprisingly wise for one so youthful), I decided that getting one of the used machines would be a good investment. Given how much I've been sewing in the past few years, I can only presume that the new machine will make that sewing easier and more enjoyable. I stopped by the shop one day to pick up some thread and mentioned that I'd decided that I wanted one of the machines. About a week earlier, they'd told me that the machines were out being serviced, so I was taken by surprise when they said they had one ready to send home with me. Sure, I'd decided that I was going to get one, but hadn't planned on getting one that day. But, no sense in procrastinating, so I bought the machine, hailed a cab, and headed home. My husband was out of town, so I photographed the friend in the cab and texted it to him. He was not entirely surprised. So, my new machine is home now and I'm not disappointed. It's a little quieter than the 731, which means I can better hear my NPR shows as I sew, and I appreciate the highly specific stitch length options...not to mention the many stitches available! Included in the purchase price was a three-hour "get to know your machine" guide class. Among other things, we learned how to use the needle threader (I'm still doing it the old-fashioned way), the walking foot, the Bernina Stitch Regulator, and (perhaps my favorite) the programmable memory. Even though I haven't used her machine for many years, my muscle memory wants to use anything by my knee to control the speed of my sewing. It's going to take a while to retrain myself. I have plenty to learn about all the ins and outs of the machine, but I'm very pleased with my purchase and look forward to years of happy quilting together. It is true, you will L-O-V-E this machine! Congrats.